I recently bought a second power supply for my laptop. The laptop requires a 330w power supply (it runs a desktop grade CPU), which costs around £120 (Laptop is the Asus GL702ZC). I managed to source the exact same power supply, except fitted for a different dc port/plug socket for £40, thinking it would be relatively straightforward to find a converter for it, or even a plug that I could solder on to it if need be. It's basically been impossible to find this socket. I visited RS Components in the UK and even they didn't have any of the specific plugs/converters on their database. 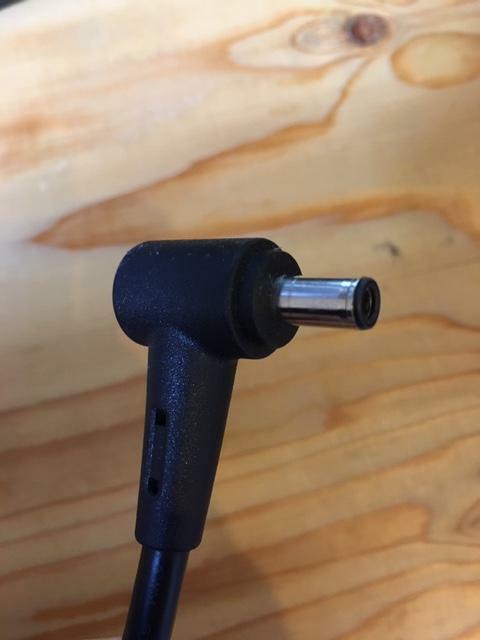 I was wondering if anyone knows where I should look to find this plug. I have looked on ebay and ali express, but no luck either.. The first thing to do is check if your plug has 2 or 3 pins. Most high current laptop plugs use the outside of the cylindrical sleeve for -ve and the inside of the same sleeve for +ve (it looks from your picture that this plug might be one of them). The centre pin is then usually used for IR compensation, or authentication (if you're unlucky enough to have DRM in your PSU). Most of these connectors are expected to be soldered onto a cable and then have a PVC over- moulded cover and strain-relief applied. So they're not really much use if you want to do it yourself. Your best bet it to find a connector pre-attached to a length of cable and then join it to your new PSU. aliexpress, and to some extent ebay, have plenty of hits for "6mm laptop plug". When you join it either use a premade cable joiner (pretty large and ugly), or solder and heat-shrink. If you use glue lined heatshrink for the outside it should gain some strength. Not the answer you're looking for? Browse other questions tagged dc adapter or ask your own question. Can a 2-prong AC/DC converter switch polarity based on inverting the plug? What could happen if I plug into my Arduino an AC adapter instead of a DC one? Power adapter efficiency standards, any drawbacks? Is there any way to modify the output voltage of a laptop adapter from 18.5V to say 7V or 13.6V? What is a single socket to ground-only plug adapter for electrical outlets called? What happened to my plug adapter?